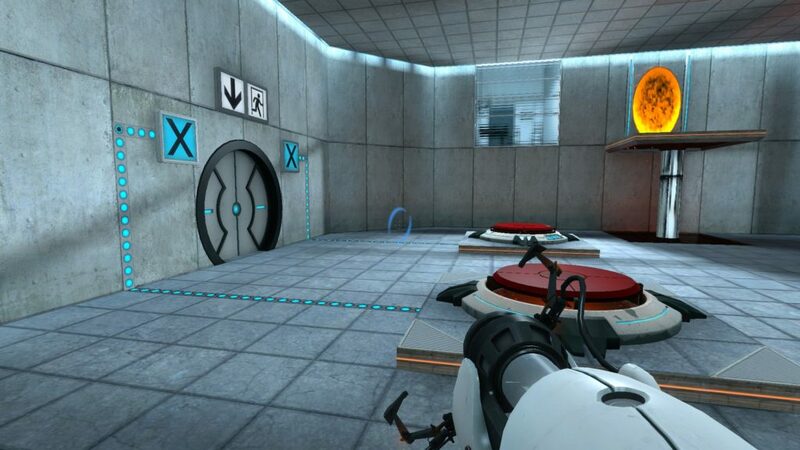 This post continues a series on the way Portal carefully interweaves its core mechanics to create interesting and engaging puzzles. If you missed the first one, read it here before continuing, otherwise this post might not make a lot of sense. These early chambers, in most cases, introduce or redefine mechanics in relative isolation. 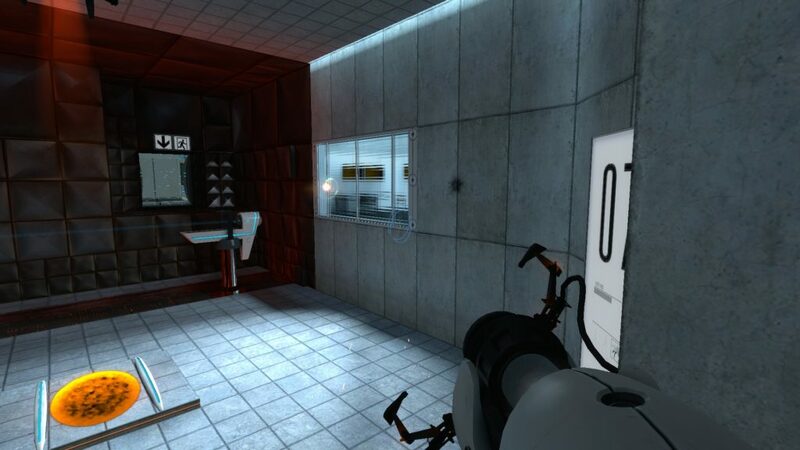 Test Chamber 00 is a simple room with a box and a button, completely devoid of anything which could distract from the objective. Similarly, when the player first acquires the Portal Gun, there is nothing to pick up or move around for a couple of chambers, encouraging total focus on understanding the new ability. In Portal’s mechanical symphony, these instances are akin to solos; the other mechanics fade out to let one take center stage. Test Chamber 04 begins to weave these mechanics together again with a simple demonstration of how portals and boxes can interact. Notably, the button to open the door is strategically placed in the entryway to the chamber. Most players will step on it on their way in, and in doing so will see the door open across the way, right in the line of sight the hallway encourages. So close yet so far—but the path is in sight as well. Naturally, it wouldn’t be much of a puzzle if they could simply fire a portal into the hallway beyond the door, so not only is it paved with non-portalable surfaces—a new facet of portals we’ll discuss more later—but it is blocked off by a pane of glass. The player can see the door open, but cannot reach it from the button. Instead, their peripheral vision notices the box dropper above a pit off to the side, bringing their attention to the first step of the solution. 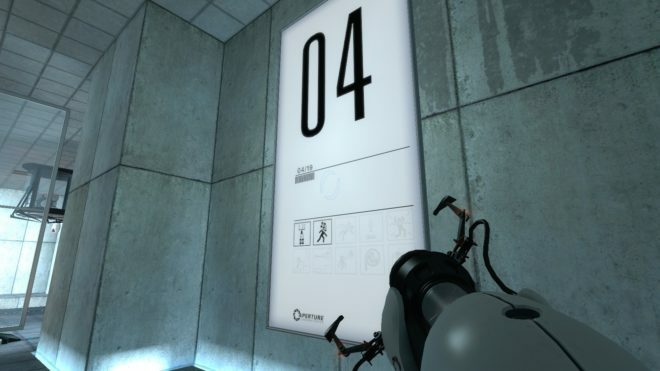 Placing the box on the button and proceeding to the elevator leads the player to Test Chamber 05, which introduces a simple yet new dimension to picking up objects: the presence of more than one box. Twice the buttons, but not quite twice the challenge. The centerpiece of the room is the pair of buttons connected to the door, both of which must be pressed at the same time for it to open. Adding an extra layer of challenge, the orange portal is out of reach from the ground, requiring the player to use the blue portal to get to its elevated platform. This elevation serves two purposes. First, it offers a vantage point from which they can see both the cube on another platform across the way—straight ahead from the orientation of the portal—and the cube in the pit to the side. Two boxes, the perfect companion to two buttons. 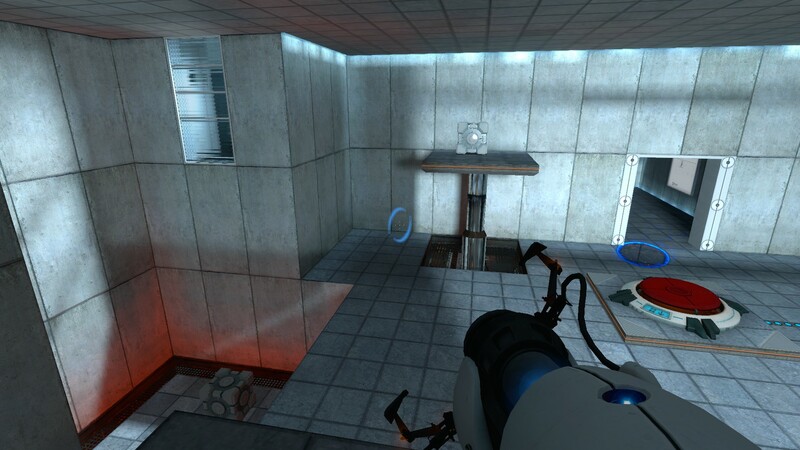 Second, it prevents the chamber from having an easy half-solution; while the player can place a portal beyond the door by standing on one of the buttons with a cube on the other, they can’t get through it because they can’t reach the second portal. 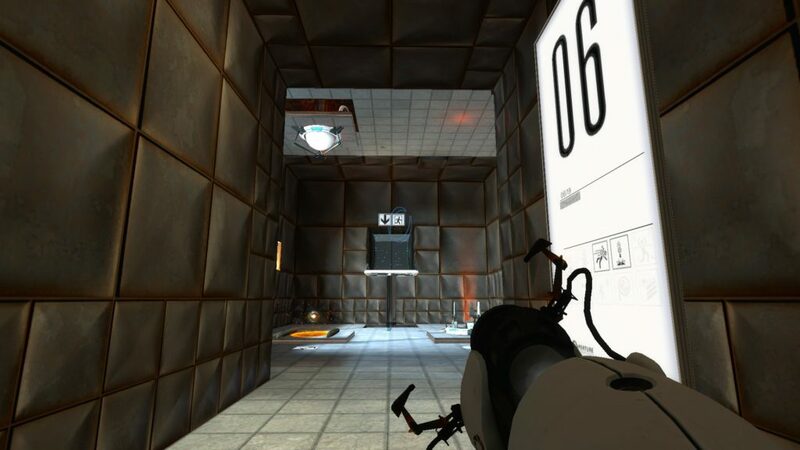 With the first quarter of the game out of the way, I’d say it’s about time we talk about another aspect of Portal’s design: Test Chambers come in pairs, one to introduce and one to extend understanding. Take the previous two for example. Test Chamber 04 introduces the interaction between portals and boxes, and 05 expands on this by adding a layer of complexity to each; the orange portal is harder to reach and there are two boxes instead of just one. While not quite a mirror image, Chamber 05 (bottom) is a clear escalation of Chamber 04 (top). In Chambers 00 and 01, the room with a box, button, and door is expanded by separating each element into a discrete area accessible with portals. 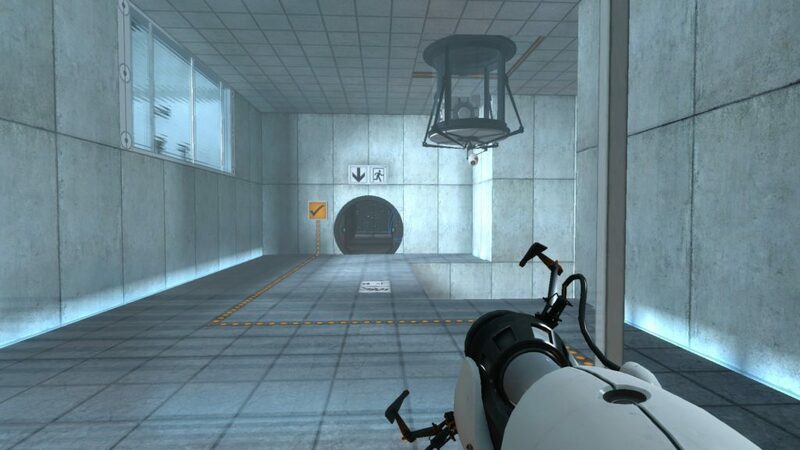 02 and 03 provide the Portal Gun and demonstrate the way it changes the player’s mobility. It’s a micro example of the dynamic of teaching a concept and testing mastery before proceeding, and the next two chambers are no exception. Test Chamber 06 is similar in execution to Chamber 00. The room is entirely focused around a new mechanic, namely the energy pellet emitter and its associated receptacle. The emitter produces a ball of energy which travels in a straight line and bounces from any surface it hits until it reaches the receptacle, after which it causes something to happen. The biggest catch is that it will instantly kill the player should they come in contact, preventing them from redirecting it with their body. However, the solution in this chamber is very neatly spelled out. Everything involved in this test chamber is visible from right here. The orange portal is placed directly in the path of the energy pellet, and the receptacle projects a spotlight on the surface immediately ahead of it—exactly where the blue portal must go to direct the pellet to it. The walls are entirely made up of non-portalable panels, their first proper introduction after making a minor appearance in Chamber 04, which limits the player’s options without inherently making the solution obvious. Delivering the pellet lowers a lift to ground level and allows the player to proceed to Test Chamber 07. As previously stated, Chamber 07 continues the trend of building on and testing the previous chamber’s introduced theme. The orange portal is now placed in the path of the receptacle, leaving the player to align the blue portal with the emitter. While at first this is more challenging than simply placing a portal at the spotlight, the energy pellet leaves a scorch mark when it collides with a wall, producing the same level of guidance with a slight delay. Now we’ve got a nice target to aim our portal at. The pellet isn’t the only thing which Chamber 07 builds on, however. When it reaches its receptacle, a lift at the far end of the chamber begins to move horizontally with much of its path under a non-portalable ceiling. 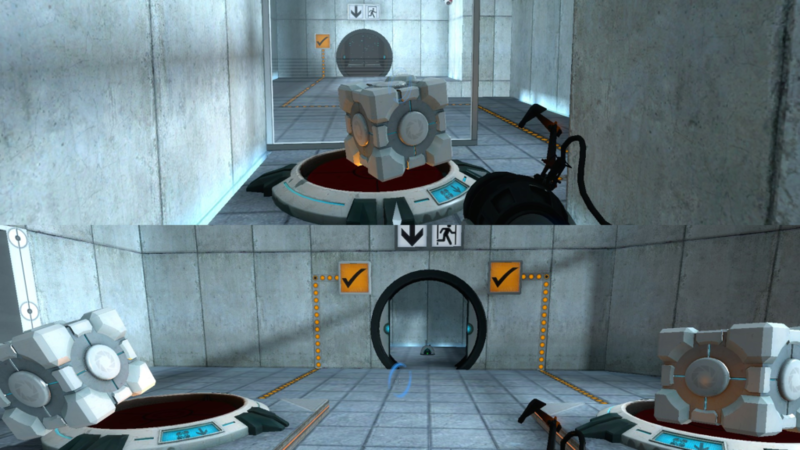 This requires the player to time their drop onto the platform while it is under the one section which allows portal placement. The limit on which surfaces can sustain a portal actually acts as a benefit here, however; by restricting the player’s options, they’re allowed to focus on one location rather than attempting to catch the platform wherever it is at the time. That brings us to the end of the second leg of our journey through Portal. Our chart has become somewhat more complex, with a few rows added and a couple more redefinitions of mechanics new and old. Join me back here again in a few weeks to continue this deep dive into Portal’s intricate introductions of its mechanics.